Visit us for a complimentary, no-obligation hair check. A qualified consultant will analyse your scalp and hair to determine your current condition. Although over 40% of women begin to lose hair in their early 20’s it doesn’t mean thinning hair or baldness is inevitable. 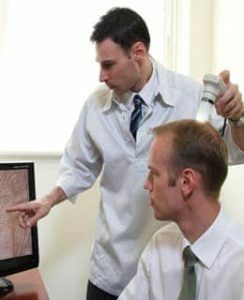 What is important is early identification of the hair loss problem, and that’s where the Complimentary no Obligation Advanced Hair Check can really help. If you’re worried about female pattern baldness the first thing to do is visit Advanced Hair for a complimentary, no obligation female hair loss check. A qualified consultant will analyse your scalp and hair loss to determine if you are experiencing any of the early signs of clinical female pattern baldness. Then you can decide what you want to do about it and which Advanced Hair Studio procedure is right for you. Send us your details and we will organise a time for your complimentary Hair Check at your closest Advanced Hair Studio. Female Hair Loss affects more than 40% of women in their early twenties, but that doesn’t mean you can’t fight it. Female Pattern Baldness can be addressed if you act quickly. Send us your details using the online application form for your complimentary no obligation hair check. Once the Hair Check is completed you will have all of the information necessary to allow you to decide which Advanced Hair Studio treatment is right to help you tackle Female Pattern Hair Loss.